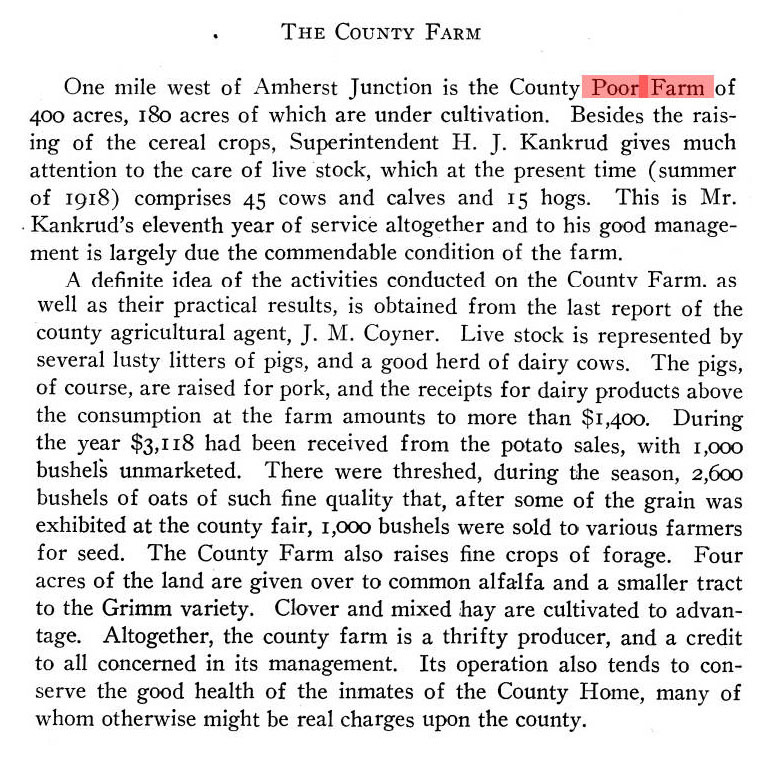 The following short article on the Portage County Poor Farm was taken from A Standard History of Portage County Wisconsin, (Chicago: The Lewis Publishing Company, 1919), Volume I, pages 76-77. One mile west of Amherst Junction is the County Poor Farm of 400 acres, 180 acres of which are under cultivation. Besides the raising of the cereal crops, Superintendent H. J. Kankrud gives much attention to the care of live stock, which at the present time (summer of 1918) comprises 45 cows and calves and 15 hogs. This is Mr. Kankrud’s eleventh year of service altogether and to his good management is largely due the commendable condition of the farm. A definite idea of the activities conducted on the County Farm, as well as their practical results, is obtained from the last report of the county agricultural agent, J. M. Coyner. Live stock is represented by several lusty litters of pigs, and a good herd of dairy cows. The pigs, of course, are raised for pork, and the receipts for dairy products above the consumption at the farm amounts to more than $1,400. During the year $3,118 had been received from the potato sales, with 1,000 bushels unmarketed. There were threshed, during the season, 2,6000 bushels of oats of such fine quality that, after some of the grain was exhibited at the county fair, 1,000 bushels were sold to various farmers for seed. The County Farm also raises fine crops of forage. Four acres of the land are given over to common alfalfa and a smaller tract to the Grimm variety. Clover and mixed hay are cultivated to advantage. Altogether, the county farm is a thrifty producer, and a credit to all concerned in its management. Its operation also tends to conserve the good health of the inmates of the County Home, many of who otherwise might be real charges upon the county. Here is a link to an article on the Poor Farm that appeared in the November 20, 1980 issue of the Tomorrow River Times, Amherst, WI. 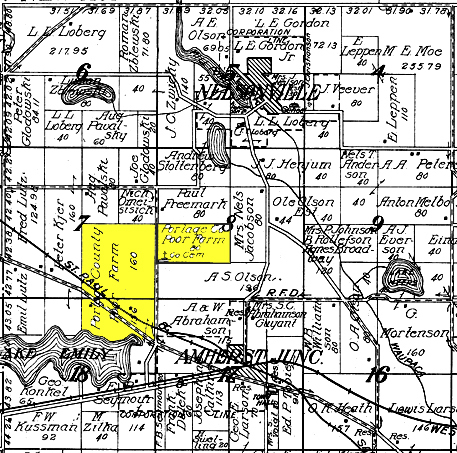 Location of the Poor Farm from the 1915 Plat book. First Biennial Report of the State Board of Control of Wisconsin Reformatory, Charitable and Penal Institutions for the Two Fiscal Years Ending September 30, 1892, pages 372-382 explaining Wisconsin's system of poor relief.